Maudlyne Ihejirika (left) wrote "Escape from Nigeria: A Memoir of Faith, Love and War" which tells her mother, Angelina Nwachukwu Ihejirika’s story. Angelina Nwachukwu Ihejirika’s 162-page memoir was written with her daughter, veteran Sun-Times journalist Maudlyne Ihejirika. The process began nearly two decades ago and included many weekend staycations at a local hotel, lunch break work sessions and other meetups. With the younger Ihejirika writing, the mother would read over drafts, offer edits and other suggestions. The elder Ihejirika, who is 89 and lives in the South Loop, said she wanted to share her story to give others faith — because faith is what it took for her to stay strong in Nigeria during her country’s civil war. The Nigerian Biafran War lasted from July of 1967 to January of 1970, resulting in the starvation and massacre of nearly 2 million Biafrans. Her story is one of courage, perseverance and resilience. While most married women would lean on their spouses in difficult times, in Ihejirika’s case, husband Christopher was away at school. She would later learn that he had left nearby Sierra Leone on scholarship to study finance at Northwestern University's Kellogg School of Management. The plan had been for them to pursue higher education overseas — not to lose communication for three years. Before the couple met, Ihejirika worked as a teacher, redefining her culture’s historical definition of a woman. She was against marriage for years until she met Christopher, a man who spoke English well and who had ambitions of going to college in the United States, as she had. They married when she was 30 and he was 32 and lived in northern Nigeria. After the birth of each of their children, Ihejirika would go back to work. Toward the end of 1965, her husband was ready to continue his education, but with rumors of a war approaching, he wanted to relocate his family before moving to college. Once the family was settled in Nigeria’s Zonkwa community he went to Fourah Bay University in Sierra Leone where he pursued his bachelor’s degree. Ihejirika didn’t know that that would be the last time she would see or hear from her husband for almost three years. People were afraid as the assaults and massacres of the Igbo people in the north spread. One day there was another attack at her school. With the help of a priest and South African doctor, Ihejirika and her children escaped to a safer place. She was pregnant with her sixth child as she fled her home for safety. It would take the help of strangers to reunite the family; during that time her strength came from God, she said. She continued to go to Catholic Mass every morning and return in the afternoon to feed her children. “After feeding them, I would put them in the bunker, to avoid the bombs and cover the top with palm leaves,” she said. Her mother-in-law would watch the children while she helped prepare meals for soldiers. As her world fell apart, she prayed. She said she didn’t know where her husband was, and he had no idea if she was alive or dead. An Irish nun who had refused to leave the country set off a chain reaction that helped bring Ihejirika and her small children to Chicago. The nun had helped send out a letter that eventually found Christopher. It took a Northwestern professor and his wife, along with four North Shore couples, churches and synagogues, a lawyer and two congressmen to create an escape plan for Ihejirika and her children. Fundraising and seats on missionary flight out were the next steps before Ihejirika traveled for three days alone to the warfront to secure the exit visas. 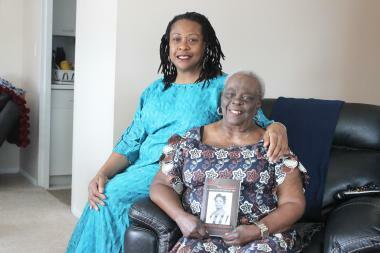 Her family was put on the last flight out of Biafra, making stops in Europe before landing in Chicago. On June 9, 1969, the family was reunited and lived in the South Commons community. Writing this book was important for Ihejirika. She said she was afraid she wouldn’t see the book finished, which is why she put so much pressure on her daughter to complete it. As a reporter, Maudlyne Ihejirika has been able to meet many great people and tell their stories. She said her area of interest has always been black history. It took putting this book together to realize what a great story she had in her own family history, she said. “I grew up with her story because her story is our story,” the daughter said. “I always knew our story of how God saved our lives, and I always knew the miraculous nature of her story, slash, our story. But I never knew the totality of her story until I began to record her oral history. Once we completed the oral history and transcribed it, and I sat back and read it, I was in tears because I couldn’t believe that this was my mother. "When I finished crying, I knew that the world needed to hear this story,” she said. The $24.95 book is available on Amazon and is sold at Bookends and Beginnings Bookstore in Evanston.